Aunt Susie Roth pouring through her scrapbook collected from 44 years of teaching Summer Bible School. Today I want to tell you about one of my awesome aunts, Aunt Susie Roth of Emma, Indiana. She did have children of her own and she lived the longest of all my aunts, 100 years, spanning1899 to 1999. 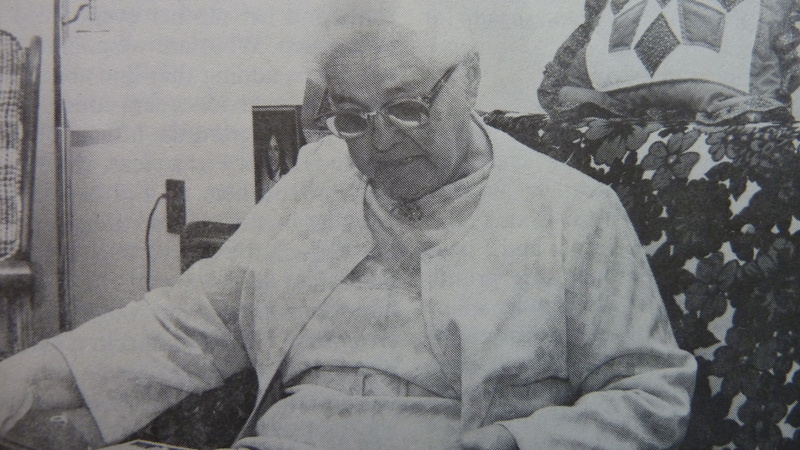 Glaucoma took her sight in later years. Toward the end, her walk with Jesus was so close she talked about she was “having cookies with Jesus.” But she was also lucid enough to tell her pastor when he came to visit that he needed to take some time off now and then to get some rest—almost the patient counseling the pastor. But what made her awesome in my book is her amazing record teaching thousands of youngsters over 44 summers of traveling here and there to help smaller Mennonite churches who were stretched quite thin in having sufficient Summer Bible School teachers. 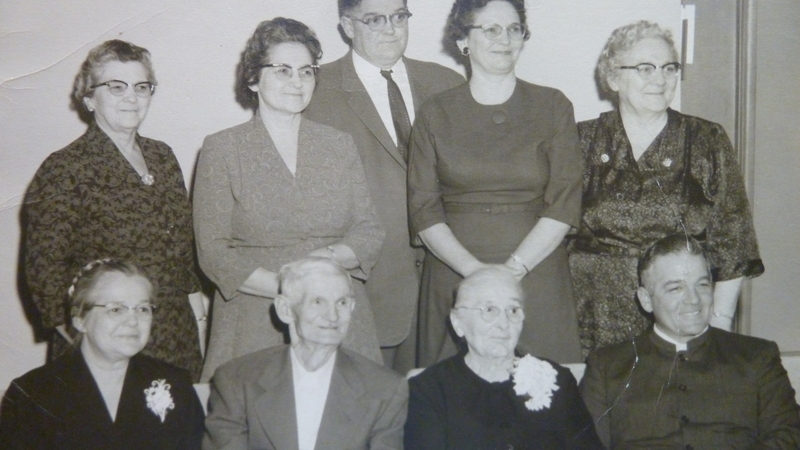 At that time in the Indiana-Michigan Conference of the Mennonite Church, many older established churches from heavily-populated Mennonite areas took on “Big Brother” roles with smaller outpost congregations in areas that had few Mennonites. Whenever a call went out “We need Summer Bible school teachers…” in conference newsletters, Susie heeded the call to this mission field with good hearted zeal and a genuine love for children–and the many lessons they taught her. She would be gone for 6-8 weeks to different locations helping in the local programs: Indianapolis, Chicago, Upper Peninsula of Michigan, southern Indiana and Kentucky. In addition to teaching in her own church, Emma Mennonite Church and others as asked. I was privileged to travel to teach with her in Chicago and Upper Michigan, and then one year she and her husband, Dan, traveled to Kentucky to teach with me where I was stationed in Voluntary Service. Her work in Chicago was in association with a women’s and family shelter called “Gospel League Home”* and my experience teaching there in a gated facility in a rough area of Chicago where she sometimes confiscated knives from little boys in her classes–gave me a tantalizing introduction to life in the inner city—and also its heart wrenching needs. We rode Chicago’s “L”, went to the Loop, and she assured us that if we stayed long enough, we too would get used to the noise of city traffic, sirens and blaring horns all through the night. I marveled at this small town aunt so wise to the ways of the city. She recalled one little girl who was supposed to tell the story of the Good Samaritan for the closing Bible school program. In practice the child kept inserting that the Good Samaritan bought the beat up man he was helping an ice cream cone. The little girl was dutifully told to leave that part out because there certainly wasn’t any ice cream in the Bible. Susie recalled the girl’s clear calm voice while reciting the piece and twisting the hem of her little dress. Susie held her own breath as the child neared the ending and announced “So the Good Samaritan took care of the man, left him some money, and bought-him-an-icecream-cone,” she said in her Revised Child Version of the Bible, before dashing off the platform. But Susie’s educational methods were what helped Susie cope even in keeping classes as large as 23 children (the biggest class) engaged and occupied. A wallpaper hanger and painter by occupation (along with raising two sons and a daughter), she had some teacher training (Goshen College) but more important was that she knew the need of children to wiggle. 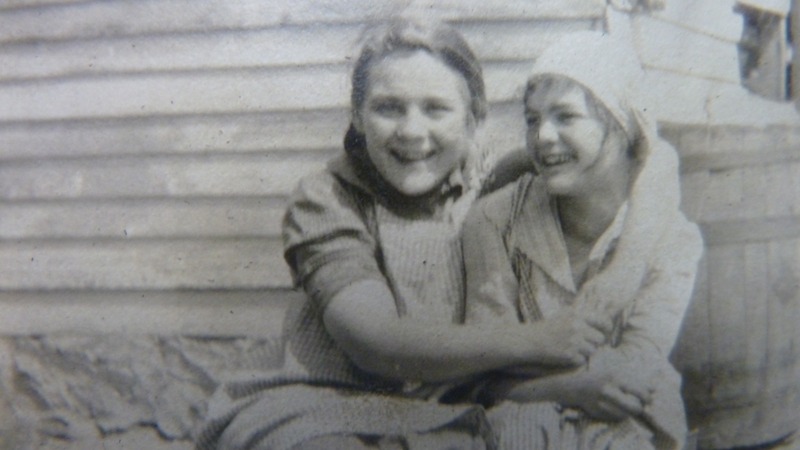 Susie, right, and her sister Irma, left, who were dressing up circa 1916: she knew how to have fun. In 1980, at the age of almost 80, she was invited back to the Gospel League Home to help teach. “Oh you can’t use me anymore,” Susie hesitated. “Oh yes we can” was the reply and Susie went in an assistant teacher role, making 22 years she served at the Gospel League Home. Over the years she also volunteered as a cook at church camps, meaning she would spend 8-11 weeks away many summers, just coming home weekends between stints to clean up her garden and flower beds. And her husband, Dan, did not seem to mind. That was Susie. It was a model of service and love that I’ve never duplicated but treasure for the spirit of her service. The time she busied my young children on a visit to her home where they were growing bored and restless and she put them to work cutting out quilt patches for one of her dozens of quilts pieced together over many years. That was Susie at her finest, sensing the boredom of children, and putting them to useful work (that they thought was great fun). 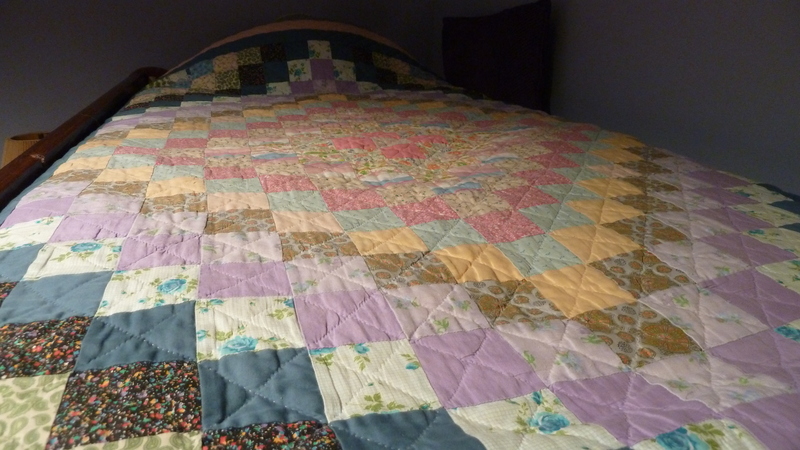 I don’t have a photo of that but I do have one of the three lovely quilts that came to my daughters, her grand nieces. An awesome aunt. I had others but I don’t think anyone else matches her record of Summer Bible School teaching 44 years in a row: not just for one or two weeks, but 6-8 weeks at a time. Were you privileged to have an awesome aunt or uncle or special relative? I would love to hear their story. I will consider using your stories in an upcoming Another Way Column (If permitted). To “enter” the Emma General Store much as it was in the 50s when I loved to visit Aunt Susie and Dan (right next door to their house in the unincorporated town of Emma), check out the Emma Cafe website here. For a history of Summer Bible School or Vacation Bible School in the Mennonite Church, check here. *Finally, I learned that the Gospel League Home was an arm of the more famous Pacific Garden Mission but eventually the Chicago Tribune reports here (sadly) what happened to the property in 2006. She had innumerable God children aside from her own nieces and nephews and eventually the greats. I heard the story of how when she was a university student in Toronto where my parents lived, that from a very early age she would come and collect me and take me home to Peterborough on the train where my grandparents were watching expectantly and saying to one and other “Does she have the baby with her?” When we got home to grandma’s I would be put to sleep in her dresser drawer. Fast forward to when I got married and had a family . Whenever she would travel up our way she would always stop in to visit with us (Especially if we had a new baby in the house) She was usually accompanied by one of my cousin’s children who lived nearby to her . In fact whoever had a new baby in the house would usually receive a visit from her! When I was very sick for a period of time in the ’70’s, she took our 4 year old son to stay with her for 6 months . She was very much missed when she passed away. Caro-Claire, I commented on your post on FB related to this story and then I found you had put it here too. That’s fine and great–you catch different readers that way. Just wanted to thank you again for sharing it and will it be ok if I indeed condense parts and share it in my Another Way column sometime? It is a great example of an aunt who was single and took time to make relationships a priority in a special way. You are most welcome to use any part of my note about my Auntie Phil I still have a lot of things that are not unpacked including most of my photo albums But I will try to find a picture of her and share it as well . I think you also saw that she was also very much involved with her great nieces and nephews as well as her nieces and nephews and God children..
ps …it was the 50’s not 40’s when I was in Kentucky with Susie. Thanks, Margaret, for adding this! Yes, I had/have an awesome aunt like yours named Aunt Ruthie, who mentored me one-on-one as you mention. I loved seeing your Aunt Susie’s quilt and the lovely line about her relationship with her Lord, like “having cookies with Jesus.” And what a wise woman to guide her students for some exercise when their sitters couldn’t take any more sitting. Ha! The quaintness and charm of this simple (but not easy) way of life is endearing, heart-warming. I believe this essay was posted before I “knew” you online, Melodie. Thanks for the link on my website today. Thanks for this follow up and thanks for checking out Susie’s story. I have heard you name your Aunt Ruthie before. My daughters have their dear Aunt Pert, who comments here from time to time. And yes, it feels like I’ve known you for a long time but it has been relatively short! Hope to meet up with you sometime!